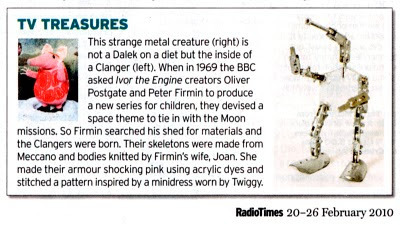 This week’s Radio Times has a small, tentatively Who-link feature under its TV Treasures thread. It shows a metal armature from an original puppet Clanger. 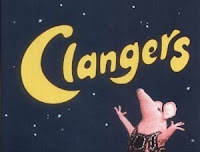 For those that don’t know of The Clangers, it was a children’s animated series from the early 1970s featuring little knitted aardvark-like aliens who lived on the moon. Made by Oliver Postage with each episode running only 10 minutes, they have become part of the childhood on countless people, myself included. 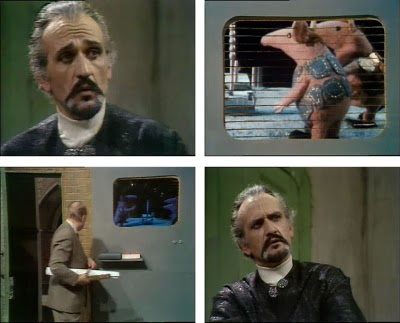 A clip from an episode appears in The Sea Devils, where The Master is watching his prisoner cell tv, thinking it is an alien transmission. The prisoner Governor has to put him right that they are just puppets!